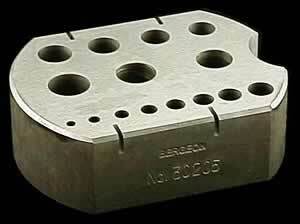 Used as a base for staking, riveting and drilling small parts; great for watchmakers and jewelers, but not limited to. India made riveting stake tool with 15 holes ranging from 2 mm to 6 mm. 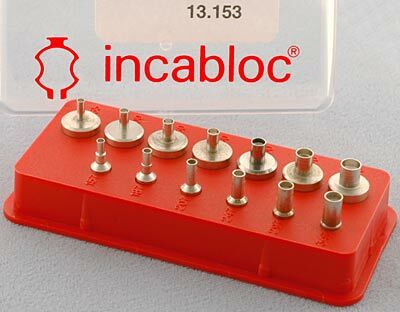 Also has 5 slots ranging from 0.50 mm to 1.15 mm. 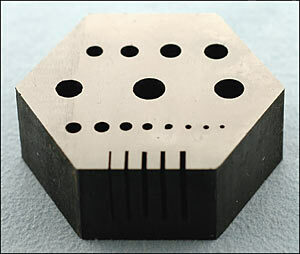 It is the shape of a hexagon, which measure 27 mm each sides (6-sides all around) by 20 mm in height; with diameter at 46 mm.